Step by step they get their way, based on a deep understanding of our ROE and our responses at every stage. Once they have control of our boats, they can drive them to Farsi Island, and remove every single GPS device, radar, cell phone etc. Then, there can be no proof of where the attack happened. 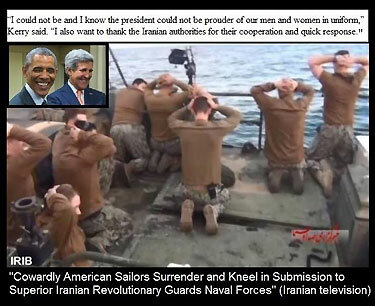 And worst of all, Obama and Kerry are happy to go along with the lie, in order not to upset the nuclear deal applecart. 2 Feedbacks on "More From Matt Bracken"
Here is the one bright spot. The masters of the seas didn’t circumcise the girl sailor. The truth of any matter of state is the direct opposite of whatever John Kerry claims.